Blue Ridge, Ga. – While Fannin County has remained for the most part unscathed from mother nature’s recent rains, we are not out of the woods yet. There have been reports of downed trees and power outages in our area, but thankfully we have thus far been spared from widespread damages. With only a few more days to go before we see a period of sunny skies, TVA has released a warning for our area. We have stopped discharge from your area’s reservoirs due to the downstream flooding. Depending on the amount of rain we get this weekend, we expect Blue Ridge, Chatuge and all other tributary reservoirs to quick rise to summer pool or above. Residents should check their docks and move any equipment near the shore line to a safe location. 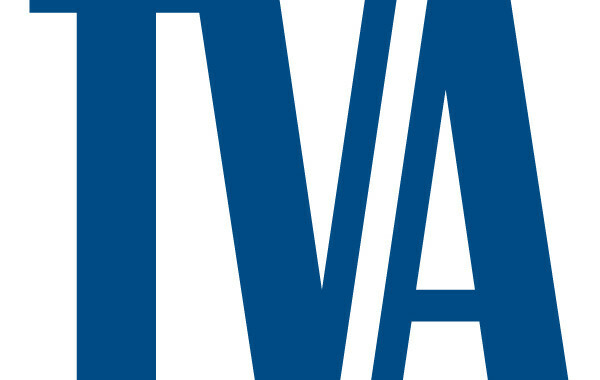 Monitor TVA Facebook and Twitter for updates. Stanley Rapids off of Aska Road. The popular “rocks” are completely submerged due to recent rains. 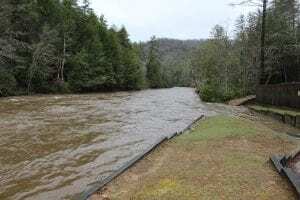 Sandy Bottoms Recreation Area shows the significant water rise of the Toccoa River. I think we all breathed a sigh of relief when Irma came through Blue Ridge doing relatively little damage. But, what if it had lived up to all the dire predictions? Would the city have been ready? We know that our emergency management team works hard to ensure readiness when needed. You may have seen them performing practice drills that encompass a variety of possible disaster situations. It is comforting to know we have a fine group of men and women at the ready when we need them. 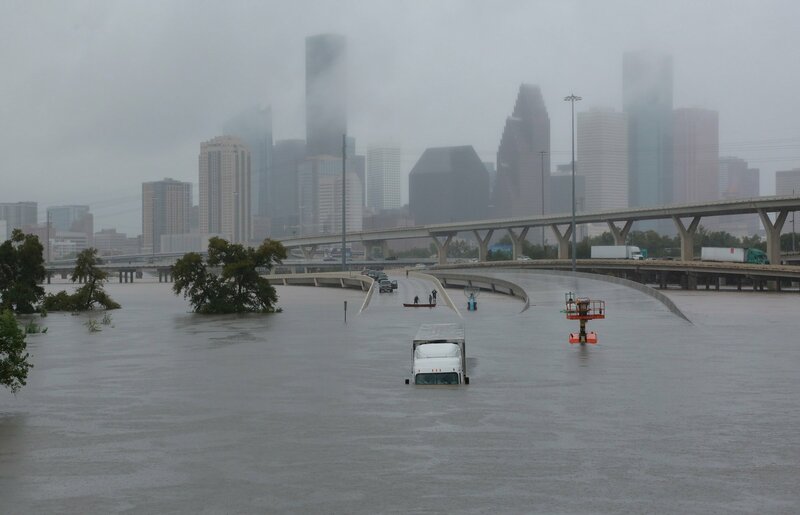 But, is our city infrastructure ready for the next disaster? We have seen the flooding on Ada Street and on W. Main Street after it rains. One can only imagine the damage that would be done to property in the event of a major weather event. 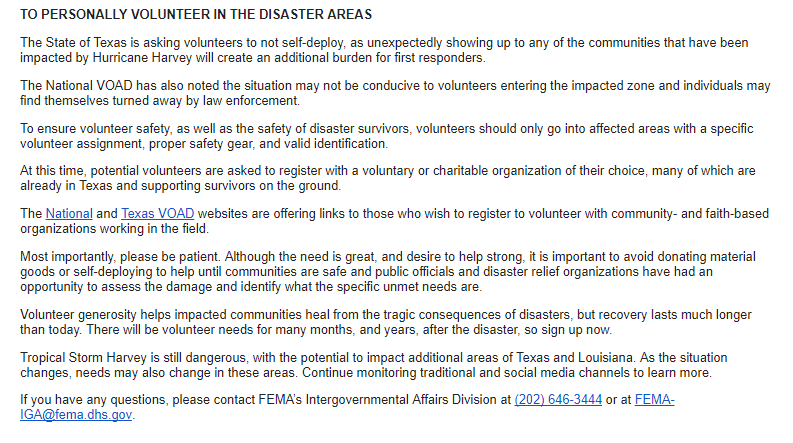 And how difficult would it be for our emergency responders to get to people in need if the roads are impassable? If elected, one of my first priorities will be to address our outdated infrastructure. We need to know what, where, and why we are having these issues. Once we have answered those questions, we move on to how we are going to remedy the situation. These are hard questions that will require hard answers, and elected officials that are willing to tackle these issues. Our city is beautiful, indeed. We have lovely public spaces, a fine playground, a renovated train depot. Our newly completed downtown streetscape makes our city even more tourist friendly. All these are reasons that Blue Ridge is included in so many “best of” articles. But, it won’t matter how beautiful our city looks if it is not built on a sound infrastructure. We must address this issue now, or pay the consequences later. Your vote for me will be a vote for someone not afraid to tackle the tough issues! 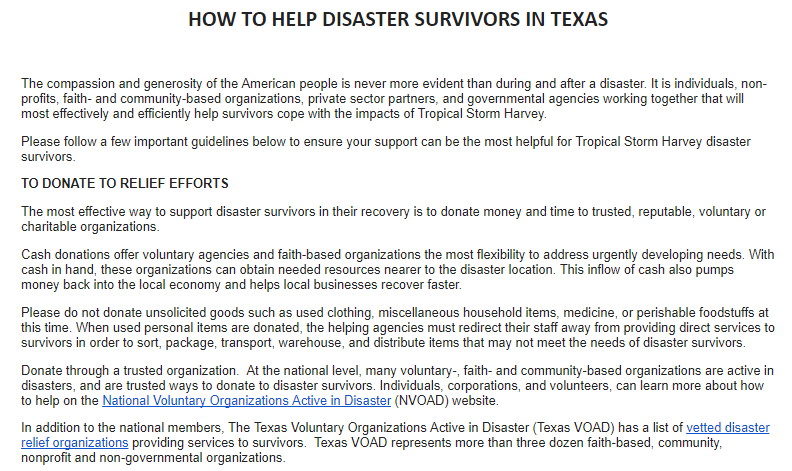 This information is from the National Weather Service. To see the full NWS Radar Image for Georgia please follow the link. The remnants of Tropical Storm Cindy will push east through the weekend. Expect the moisture associated with TS Cindy to interact with a boundary that will move south across the region through Saturday night. 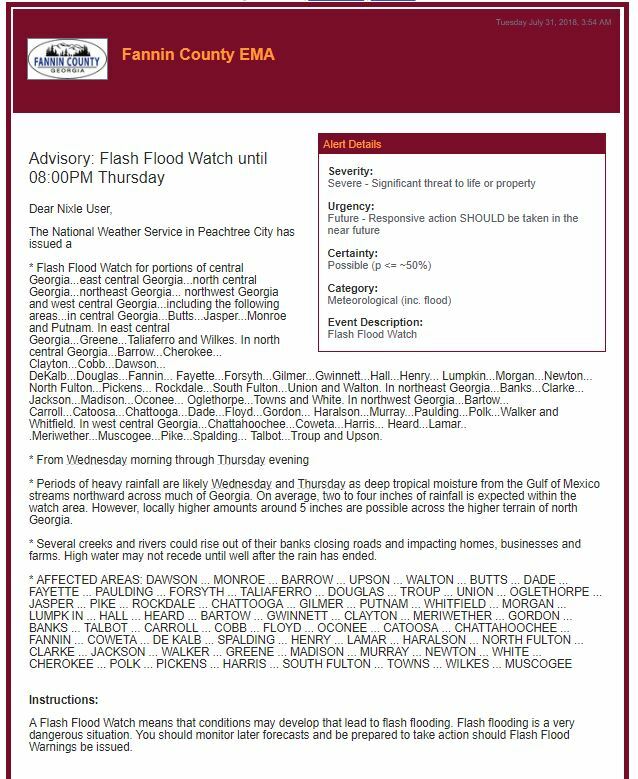 Given the already saturated soils and plentiful moisture expected with this front, we may see more flooding issues, especially across north GA.
Over the past 24 hours, we have observed 1-3 inches of rainfall, mainly north of I-20. This will be the main area of concern in terms of flooding potential. 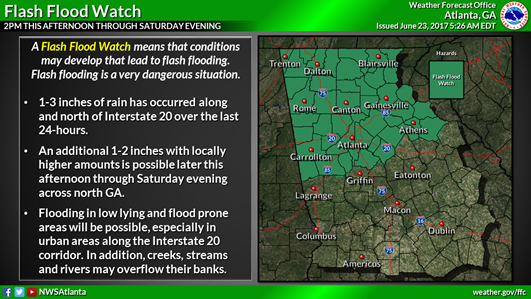 Flash Flood Watch is in effect across north GA (along and north of I-20). From 2 PM this afternoon through 8 PM Saturday evening. An additional 1-2 inches with locally higher amounts is possible, potentially within the metro Atlanta area and points north and west. 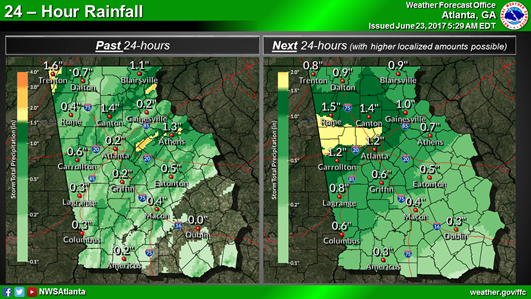 This may lead to flooding in low lying and flood prone areas, especially in urban areas and along Interstate 20. 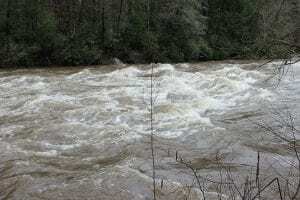 In addition, creeks, streams and rivers may overflow their banks. Next Article » GBI Seeks Help with Identifying Body Found in Banks County. 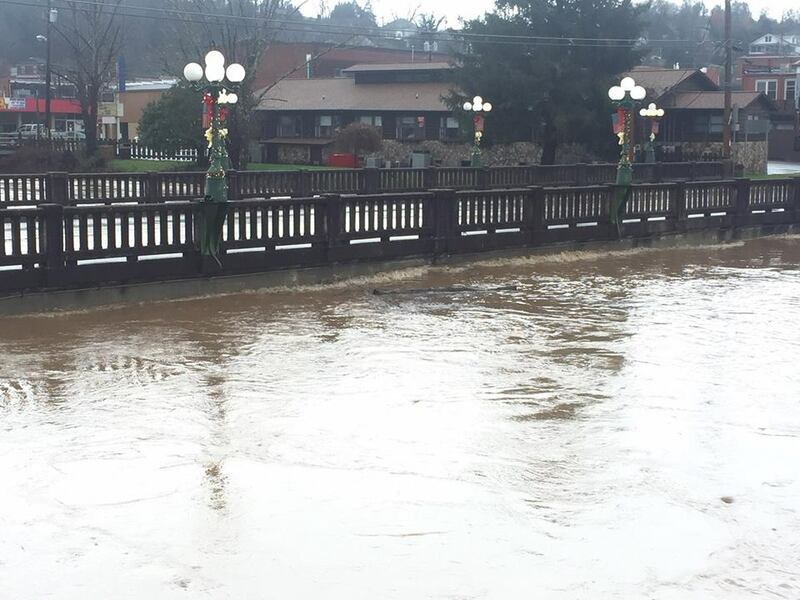 The rain and storms of Christmas, 2015 brought flooding, flooding and more flooding to Blue Ridge. Our prayers for all those whose businesses and homes were impacted. For some businesses and property owners downtown, this was just like it has been for months -a nightmare. Storm drains clogged up, the small drain pipes could not handle the volume of water. Lakes formed throughout downtown. 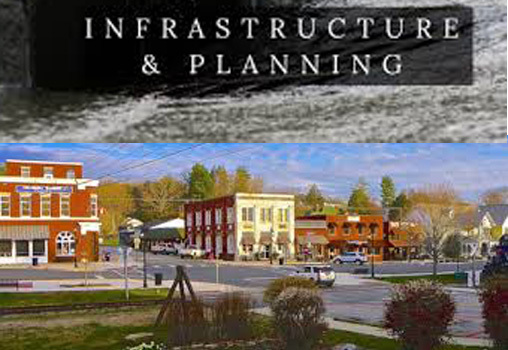 Even though the storms of the last two weeks were magnificent they illuminated the issues with the failing infrastructure in downtown Blue Ridge immensely. 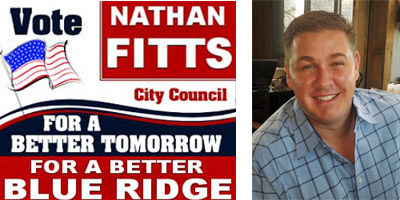 These are the issues the citizens of Blue Ridge are begging the council to address. It was Christmas, but we hope Arp, Pack and Kendall took the time to get out and survey downtown to view what was happening in their city. If not, then where is their responsibility and their concern for what ails the city? They can’t understand budgets and why the people are crying for them to “WAKE UP” and stop wasting tax dollars on non-sense investigations and attorneys and make intelligent plans on how to help fix the critical issues. They can’t take off their rose colored glasses long enough to see that precious dollars are needed to help start the downtown projects that everyone wants done. In the last special called Council meeting, the mayor brought the city attorney David Syfan, grant writer Angela Steedly, several professional consultants and the council together to discuss the projects and funding sources. 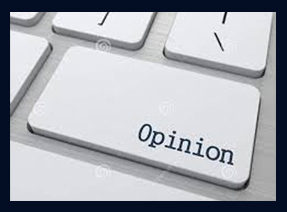 After reviewing the same information that has been on multiple agendas over the past year, the council did vote for engineering to begin the evaluation of the utilities and storm drains. There was reluctance to chase outside funding sources such as grants but after an hour of confusing and nasty dialogue instigated by Arp, there was agreement that funding is absolutely needed to get the work done. Arp pretended to understand the funding process, but still exhibited a lack of comprehension about why tightening the city’s out of control spending is needed immediately. Kendall and Pack were totally clueless in this discussion. They sat like they always do “doe eyes in headlights staring at Arp for direction.” Yes people, it is the blind leading the blind. Syfan was there to hear first hand the stale and repetitious dialogue between the “professionals” and the 3 council members who complain “we are in the dark, we are never informed on what is going on.” Arp, Pack and Kendall have heard the same information over and over, they just don’t listen nor do they want to hear it unless it supports their personal agendas. FYI: Why do these three council members vote for their family and friends to sit on the city’s critical boards who have no knowledge of what’s needed be on that board nor have the sense to comprehend the issues to be able to vote intelligently? And why did these three council members refuse to take the time to go to classes to learn how to be a council member when they were elected? They have their personal agendas, and they are ” puppets” carrying out other’s interest that is not in the best interest of the city. They have exhibited they have NO desire to stand on their own feet, speak individually about what is needed. They have made NO effort to educate themselves on what other cities are doing compared to Blue Ridge. Being a council member is a lot more than coming to meetings, sitting in the big chairs and acting like a big shot! These are all symptoms of why a recall is needed to remove Arp, Pack and Kendall immediately! 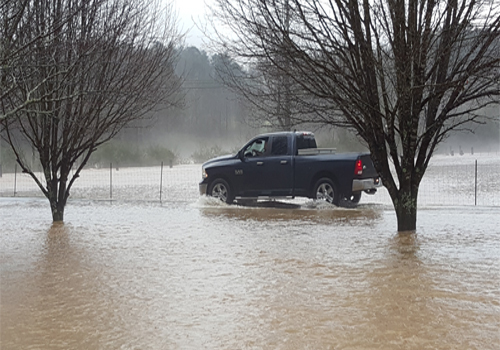 Heavy rains and thunderstorms created flooding in much of North Georgia on Christmas Eve 2015. 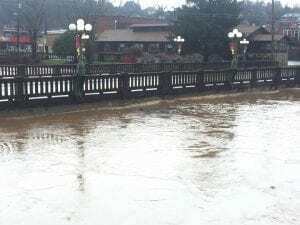 FetchYourNews.com talked with Fannin County Fire Chief Larry Thomas who told us he had been dealing with fire and floods today. Early this morning the Fannin County Fire Department responded to a lightning fire on Scenic Mountain Road off of Dial. The lightning hit a gas line which caused a fire in the furnace in the basement. Thomas explained it was a forced entry situation where once inside fire fighters were able to put out the fire with fire extinguishers. While the firefighters were inside clearing the smoke and ensuring all was safe the water outside was rising. Chief Thomas said by the time they were finished and preparing to leave they realized the water had risen 2 1/2 to 3 feet deep. All of the trucks were large enough to get out except the Chief’s and he will have to wait until the water recedes to remove his vehicle. Were all closed at last report. In addition, the bridge on Hwy 5 in McCaysville is closed until the state bridge inspector checks it. There may be water still standing in other areas as well. 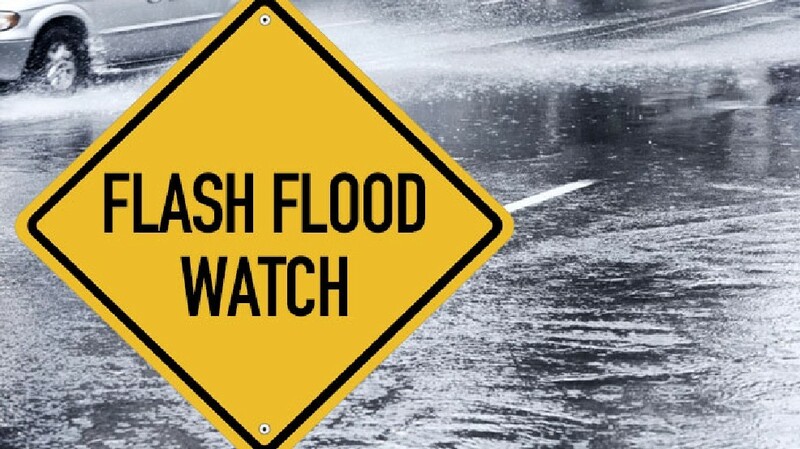 Drivers should use caution when traveling tonight and if we get more rain tonight, these areas may flood more/again. 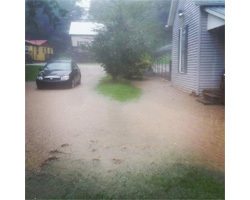 Heavy rains and thunderstorms throughout the night caused flooding in multiple areas in North Georgia. Rains and thunderstorms were steady throughout the night and into the morning with another round expected later today, Christmas Eve 2015. 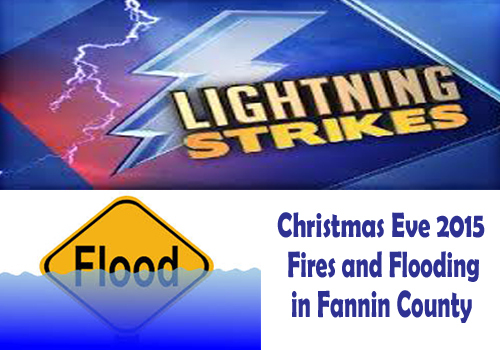 Reports and photos coming in show areas in Fannin, Gilmer, and Pickens Counties where flood waters are rising. 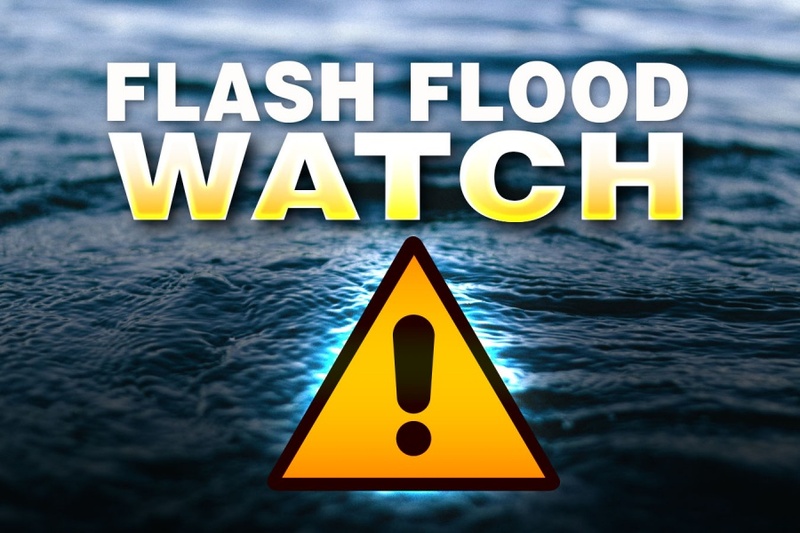 FYN has reports of roads covered in water, bridges closed or out, and other areas under water. 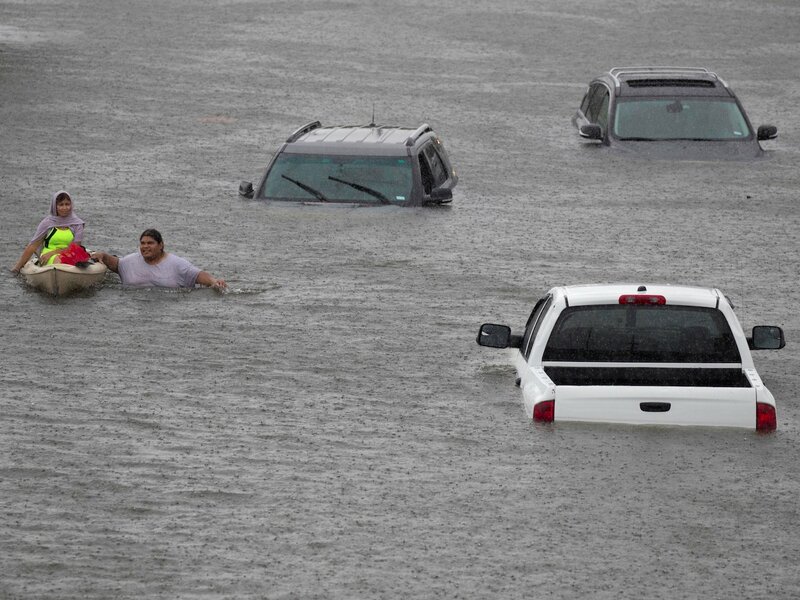 Authorities warn citizens to use caution and do not enter areas where you cannot tell how deep the water may be. We will bring additional information as received.